ROCKHILL FURNACE, Pa. — Stepping inside ex-Philadelphia Transportation Co. PCC car 2743 really is like stepping back in time. For the moment it isn’t quite the right time, but that’s starting to change. Efforts are underway to repaint the 1947 streamlined streetcar’s drab 1980s interior colors so they match up with the recreated late ’50s exterior paint scheme which was applied last year. 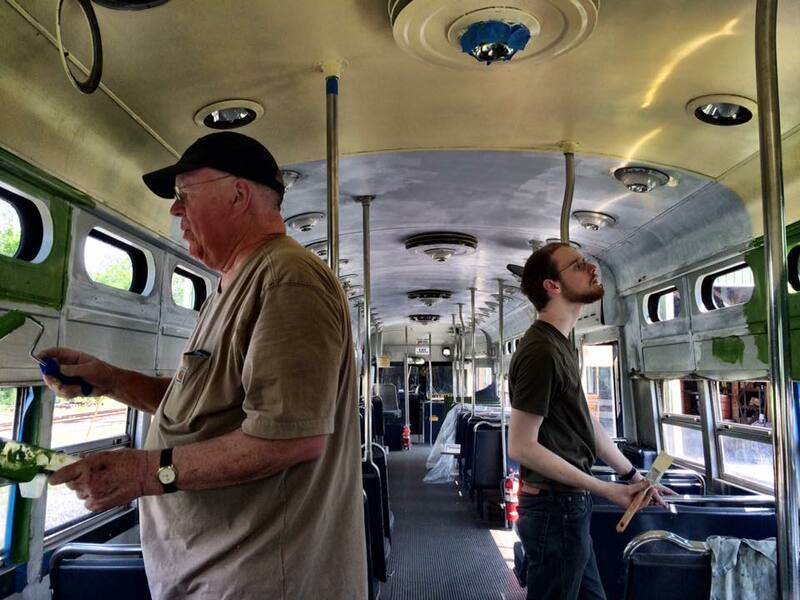 “This is going to look great,” Friends of Philadelphia Trolleys (FPT) founding member Harry Donahue said with admiration as he stood back during a break in painting recently to survey progress on the project. For Donahue, who grew up riding and photographing trolleys in his native Philadelphia, the transformation of 2743’s seats, walls and ceilings immediately rekindled memories from more than 50 years ago, when streetcars still clanged along 14 city routes. Today, only six of those routes remain. For Donahue and FPT, which helped raise funds for the renovations, the hope is that 2743’s backdated appearance will rekindle similar memories for other visitors to the Rockhill Trolley Museum in central Pennsylvania, where the car has resided since 1994, and that it will give younger visitors a sense of what Philadelphia’s large fleet of Art Deco PCC cars looked like inside and out during what many consider to have been the last years of their heyday. Car 2743 was part of a 210-unit order produced for the privately owned Philadelphia Transportation Co. in 1947-48. The single-ended, all-electric vehicles were built to the standee window body design which characterized most postwar PCC cars constructed in North America until production ceased in 1952. In an era when U.S. cities had or were moving toward abandoning their streetcars, Philadelphia in the immediate postwar years wasn’t just buying new ones; PTC was buying some two-man cars, equipped with conductor stations. Among those was 2743, which was used on the long and busy Route 23, which wended from South Philadelphia north through Center City to Germantown and Chestnut Hill. In fact, the line has remained the city’s busiest surface route even since the Southeastern Pennsylvania Transportation Authority “temporarily” converted it to buses in 1992. (Late last year, SEPTA split the line in two parts, with the lower half re-designated as Route 45). While 2743 was later converted to one-man (operator-only) configuration, Donahue estimates that it spent up to 80 percent of its working life on Route 23, based on available records. Unlike many of its sisters, he added, 2743 was never assigned to operation in the surface car subway between City Hall and West Philadelphia, nor was it ever repainted in any of the new paint schemes applied to some cars by SEPTA in the 1970s. Photos show 2743 remained in a simplified version of the PTC green and cream, with SEPTA’s second generation round red logos, until it went through the agency’s general overhaul (GOH) program in 1984. From that process the cars all emerged in a standardized color scheme of bluish-white with red and blue striping. There were some minor variations during the program; earlier cars had wide stripes, for example, while 2743 carried the later, narrower color band into its retirement. The GOH project saw 112 all-electric PCC cars thoroughly rebuilt to add another decade or so of life, intended to carry them along until SEPTA could determine what to do with the street-running North Philadelphia routes to which they were assigned. The five West Philadelphia subway-surface routes had been equipped with durable new Kawasaki light rail vehicles in 1980-81, but a SEPTA report at that time suggested conversion of the North Philadelphia lines to buses due to declining ridership (citing loss of population and jobs in many of the neighborhoods they served as underlying factors) together with the substantial cost of replacing infrastructure which had substantially deteriorated since in the days when PTC began cutting back on maintenance as its sale to the public sector SEPTA loomed. The last of those routes, including 23 (as noted above) were “temporarily” switched over to buses in 1992, with SEPTA telling the city it would look to purchase new cars and resume trolley service by 1997. Of them, only Girard Avenue Route 15 has had rail service restored, with 18 heavily rebuilt PCC cars (dubbed PCC-IIs) re-opening the line in 2005. Thus, despite the high standards of craftsmanship employed in the GOH program, 2743 and the other cars which emerged would have generally short working lives in Philadelphia. Some of the rebuilt cars remained on the property until the early 2000s for charters and special services, such as the Chestnut Hill Trolley and Center City Welcome Line, which used portions of Route 23, where the wires and rails were still intact. Many others were scrapped, sold or stored, however. Some went on to new lives in San Francisco, where they continue to thrive on that city’s F-Market line alongside other historic streetcars from around the world. Others found new homes in museums, as 2743 did at Rockhill. Volunteers there spent several years working to re-gauge the car from Philadelphia’s broad (5 ft 2 1/4 in) city trolley track spacing to operate on Rockhill’s standard gauge (4 ft 8 1/2 in) line. The single-ended car also had a front trolley pole installed to permit operation on the rural single-track museum line, which lacks turning loops. Otherwise, it would spend more than a decade in museum operation looking exactly as it had when serving Philadelphia commuters between 1984 and 1992. Donations from Rockhill’s many supporters helped push the project ahead. Car 2743 was trucked to Star Trak Inc., in Boonton, New Jersey for exterior body work and repainting. It returned to Rockhill in 2015 resplendent in PTC colors. Of course, that was not the end of the story. Volunteer restoration projects are the work of many hands, many talents and many wallets, as well as much time. The car may have returned in shiny green and cream, but step inside, and 2743 was still wearing the subdued blue-gray paint applied by the SEPTA during renovations in the 1980s, accented by stainless steel fittings and dark blue seats. The next phase, then, was to put the trolley’s innards in historical sync with its shell. Over the past few months, Donahue and other volunteers, including this author, have trekked to Rockhill from around Pennsylvania and nearby states, carefully repainting the ceiling, walls and seat frames. The contrast, as the work progresses, has been dramatic, as the brighter PTC colors evoke the car’s earlier atmosphere of warmth and Art Deco style that was lost under the clincal and uniform GOH tones applied a generation later. A few important curatorial points should be made here. The renovations are not a full restoration in the true sense of the word, due to structural changes made by SEPTA in the 1980s. The GOH project replaced the original armrests and hand-cranked windows with straight panels and school-bus style side windows, as well as adding stainless steel trim and modified windshields. Fully restoring the car to its pre-GOH appearance would be a more expensive and labor-intensive process than is possible at the present time. So while the old colors do cover some newer structural elements, the final appearance should give visitors a substantial sense of what the car looked like in the 1960s, thanks to Donahue’s careful matching of original color samples. The project also has provided an opportunity to tell the story of trolley cars to a new generation, as younger volunteers like James Kelleher, a talented art student home from college for the summer, have helped take part in the painting. Other elements underway include lamination of some period advertisements which already were on the car, as well as the search for vintage 1950s or ’60s ads which can be reproduced, as well as PTC-era Route 23 schedules for display in the timetable racks. Donahue, meanwhile, is at work on another key element: seat restoration. Working with a southeastern Pennsylvania upholsterer, he has been sending the seat cushions and backs out to have their dark blue SEPTA coverings replaced with brown material, as in PTC days. Being a volunteer effort, Donahue has been shuttling the seats between the museum and the upholstery shop, more than 100 miles away, just as he has done with the paint and other material necessary for the work. The seat restorations are being funded by individual donations, and as of late June, 12 double seats had been paid for, leaving many double and single seats yet to be done. The cost of a double seat is $235, while a single seat costs $195. Anyone interested in donating a seat or otherwise assisting with the project can visit FPT’s Facebook page, email the group at fpt2799@comcast.net, or write to FPT Inc., P.O. Box 33397, Philadelphia, PA 19142.